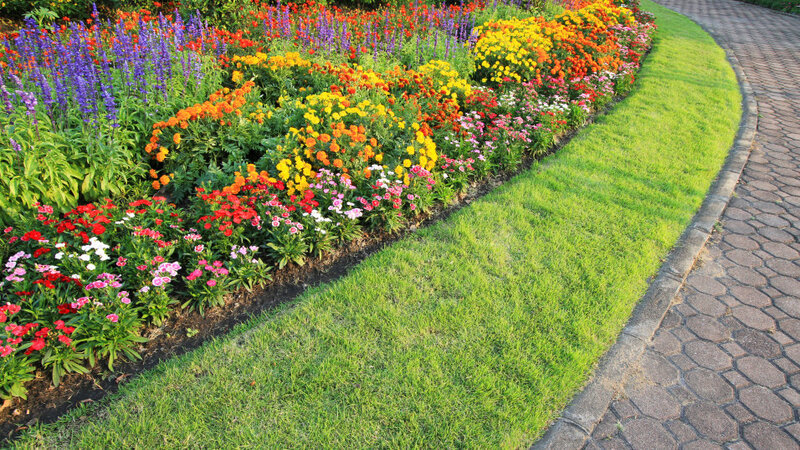 Leave municipal type bedding schemes to the parks & have a go at creating something unique this summer. Put your imagination to the test & take the lead by flying the flag for exceptional summer displays. There are lots of new varieties to choose from in a wealth of colour options, they also include old favorites that are now behaving differently like the trailing Balconita pansies. So why not have a go at experimenting with new introductions & overlooked varieties in an interaction of colour & texture to produce an outstanding summer display! Bedding plants are the star performers of any summer garden & provide a focal point whilst offering fantastic value for money – many flower continuously from May to the first frosts in October. Here’s how to get the best from them, while our simple ‘how to’ guide will help you plan a spectacular hanging display. When selecting plants, consider the visual effect you prefer. For a mellow scheme, try colours that are closely related, such as shades of pearly pink, purple and blue. These schemes will help to quieten your thoughts and soothe frayed nerves. Pale colours also reflect light, giving them a luminous quality on patios that catch the evening sun. A more dynamic, vibrant display is achieved by combining oranges and reds with coppery or dark plum-colored foliage. Or, if you are aiming for a modern, minimalist look, go for monochromes; select modern planters filled with white flowers and silvery foliage mixed with blue or black ornamental grasses. Sometimes single species plantings can be very effective like these tubs of Marguerites & Senetti. Plants in containers need to be watered and fed more regularly than plants in the ground. So if your time is limited, you may want to invest in an automatic watering system. Remember, larger pots will need watering less frequently than smaller ones & plastic pots retain water more effectively than terracotta. They are also more durable and completely frost-proof, remaining intact throughout the harshest winter. Most summer bedding plants are native to hot climates and suit a sunny site. However, some, including begonias, fuchsias and busy lizzies (impatiens), are happy in shadier spots, making them perfect for courtyard gardens. For low-maintenance schemes try red, pink or white pelargoniums, blue daisy-flowered brachyscome, and dainty nemesia and diascia, all of which tolerate periods of drought. Dahlias, begonias and busy lizzies grow best in moist – but not water-logged – soil, so ensure containers have good drainage and dig grit into clay soil. Senetti, violas and pansies will provide early spring colour. The latter two also bloom throughout autumn and winter. Choose colour themes to flatter your aspect and position… white, pink’s and blues are very “cooling” and “soothing”, while red, oranges and yellows lend a fiery intensity and “warmth” to even the shadiest of areas. Pad-out your displays with handsome foliage plants for texture and interest. Felty-leaved Plectranthus, spear-shaped non-flowering Ipomea or the pewter-silver penny leaves of trailing Dichondra are so beautiful in their own right, that brightly coloured flowers almost seem superfluous. For a fabulous floral display, you can’t beat a hanging basket. We have so many pre-lined containers available now; planting your own has never been simpler. Choose a variety of bedding plants to make the best visual impact. Here we have focused on pinks and purples, which have a rich and vibrant effect. You can alter the mood of the basket by changing the colour of some of the flowers. Make it hotter by replacing pink with hot pink petunias or cooler by replacing the purple petunias with white. Alternatively make it warmer by using terracotta petunias and coleus rather than pinks and purples. To get the most from your basket throughout the warmer months you will need to keep it well watered even when it is raining, as the plants’ leaves form a canopy over the compost that prevents the rain getting through. Trimming off old flowers every two or three weeks will help keep your basket in peak condition. Then, when your basket is no longer at its best, you can re-plant entirely or prune back salvageable perennials and replace seasonal plants. Buy a lined hanging basket or line your own with a cut down plastic bag. Snip a few drainage holes into the plastic. Sit your basket on the top of a plant pot for support then fill about 3/4 with compost. Mix in some granules of slow-release plant food, such as Miracle-Gro, and some water saving crystals. Add trailing side plants, ensuring the roots are fully covered by compost. Starting from the centre, add your main plants; firm in. Water well. Remember to water well all summer and don’t forget that you can use the baskets again through the winter with trailing ivies and pansies under planted with small bulbs such as snowdrops and crocus. If pushed for time, leave out the tricky seed-sowing stage and buy pot, plug or “pack” bedding for reliable results. Keep your plants warm and frost free to prevent a needless check in growth, spoilt foliage and flowers. Add water-retaining granules and slow-release fertiliser to your compost for hanging baskets and wall troughs, to lock in litres of extra moisture and provide months of easy feeding. Never rush plants outside… wait for the summer to arrive. Harden tender bedding plants off gradually, slowly acclimatising them to the harsher outdoor conditions. Begin gently by leaving the greenhouse or conservatory door a-jar for a few hours a day, before moving the plants to a sheltered position only during mild spells – returning them to the protection of a covered area at night. After 10-14 days, you can leave them outside at night if there are no frosts forecast and the weather is mild. Whether planted in the garden, pots or baskets, water all bedding plants frequently – especially during hot, dry or blustery weather. Hanging baskets and small wall planters may require watering twice-daily during sunny weather, to prevent them drying out completely. Feed once or twice a week… using a soluble liquid or powder feed. Alternatively, sprinkle labour-saving slow-release feed granules amongst your plants at the beginning of the season and simply water with a hose, to deliver a measured dose of balanced plant food every time. Deadhead regularly. Preventing plants from “setting seed” – their singular purpose in life, marking the end of their natural growth cycle – will prolong their life span and maintain flowering beauty. Snap off spent blooms between thumb and fore-finger, or use scissors for tougher-stemmed varieties, picking over plants at regular intervals… ideally on a daily basis, when watering. Do you need help with your garden? Call us today on 01 8394444 and talk to Cian about what you want to get done. We’ll be able to arrange a viewing at your property, so you’ll get an onsite assessment of price, and be able to make your requirements known in person. You can also book a consultation via our contact form.